From brainstorming mavens Carrie Anton and Jessica Nordskog comes this inspirational guide to generating fresh ideas—all without setting foot in a conference room. 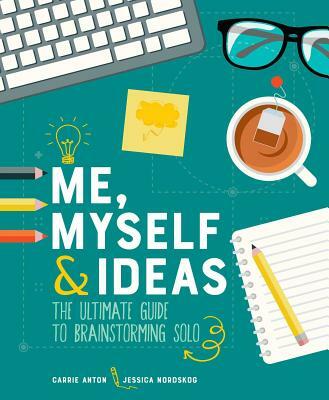 An essential resource for any self-employed, freelance, or work-from-home professional, Me, Myself & Ideas offers tips, tools, and a host of exercises aimed at crushing mental blocks and forging ahead with creative solutions. Whether you're stuck on a logistical problem or experiencing a creative dry spell, the activities in this book are sure to get you thinking (and creating) in new and powerful ways. Carrie Anton worked as a full-time author and editor for American Girl Publications’ Advice & Activity line from 2005 through 2013, during which time she wrote several contemporary nonfiction books for 8-to-12-year-old girls. Anton left the cube life in 2013 to grow Wonder: An Idea Studio while girl-bossing as a freelance writer. Her writing has been published by Women’s Health, Family Circle, Oxygen, Draft, and Outside, among others. Jessica Nordskog is the former Lifestyle Editor for American Girl magazine, where she developed crafts, recipes, and parties for girls. She later worked in product development, designing accessories for the contemporary line of dolls. In 2011, Nordskog ended her career at Mattel to begin a new one as a freelance designer. Since starting her own business, she has designed everything from logos, annual reports, and menus to t-shirt graphics and books. Her clients include Rodale, Henry Holt & Co., Bean Sprouts Café, The Water Council, and Organic Valley.